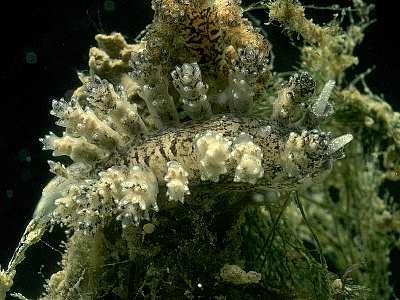 Description: A drab, dark-coloured nudibranch with no terminal spots on the ceratal tubercles. The rhinophore sheaths are slightly scalloped at the margins. The body is creamy-white but obscured by streaks of brown or black pigment. There is a paler concentration of white glands in the tubercles of the cerata, and brown or black mottled pigment all over the ceratal surfaces. A large Doto species, reaching 25mm in length. Habitat: Seems to feed exclusively on Nemertesia ramosa, normally hiding near the base of the hydroid. The spawn is a loose concertina of yellow ribbon. Distribution: Found as far south as Lundy in the Bristol Channel but more common in the northern part of the British Isles. Most records are from Strangford Lough and the Irish Sea. Similar Species: Similar to Doto pinnatifida but immeditely distinguishable by the lack of round pigment spots on the cerata. Body heavily marked with dark brown or black pigment. Pale glands in the tips of the ceratal tubercles. Picton, B.E. & Morrow, C.C. (2016). Doto cuspidata Alder & Hancock, 1862. [In] Encyclopedia of Marine Life of Britain and Ireland.